I’m back! I took a week off from posting whilst I was in Disneyland Paris but I am back and I have so much to share. If you don’t already follow me on Instagram then be sure to head over and have a look at my profile. I share life and all things Disney and the past week my profile has been full of Disneyland Paris photos! Whilst I was in Disney I of course made a few purchases. I spent a lot less on food than I thought I would which meant I did come back with quite a few pieces of merchandise so be prepared for a rather long post. I am so happy with everything I bought and I’ve been so excited to share them with you all! One of the things I spent a little bit too much money on was Disney Pins. I have always loved the Disney Pins and I already have a little collection going. I knew before I went that I wanted to add to my collection which I certainly did! The pins were bought from a variety of different shops as they are often repeated from shop to shop. I would recommend looking wherever you can if you like pins as some shops do tend to have 1 or 2 that aren’t in the others. I picked up a pin lanyard from the Disney Store in the Disney Village which cost €9.99. The prices of the lanyards varied and not all of them came with the clear zip wallet attached to the bottom. I picked up this particular lanyard because I loved the design and knew I would mainly be wearing it to store my park ticket and fast passes. I collect pins from the hotels I stay in so I picked up a Santa Fe Hotel pin as this is where we stayed for the duration of the trip. 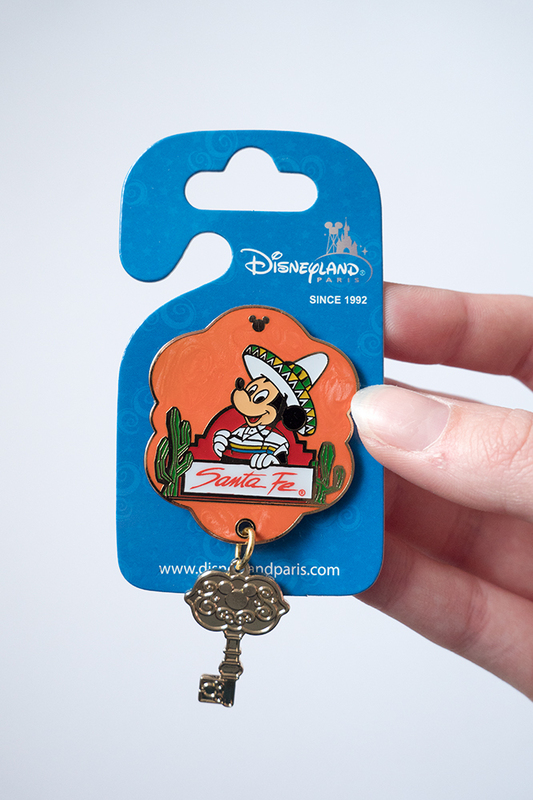 They have a similar pin for all the hotels and I already have the Disneyland Hotel version from my first trip. The pin was one of the ‘blue’ pins and cost €8.99. I also like having pins from the year I have been so for this trip I decided to pick one of the 25th anniversary pins. 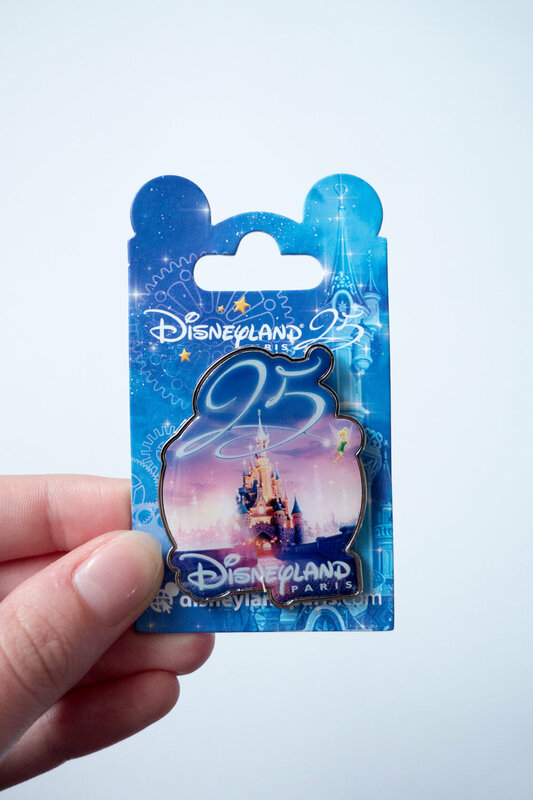 I bought the standard 25th anniversary design which cost €6.99 as it was one of the green pins. 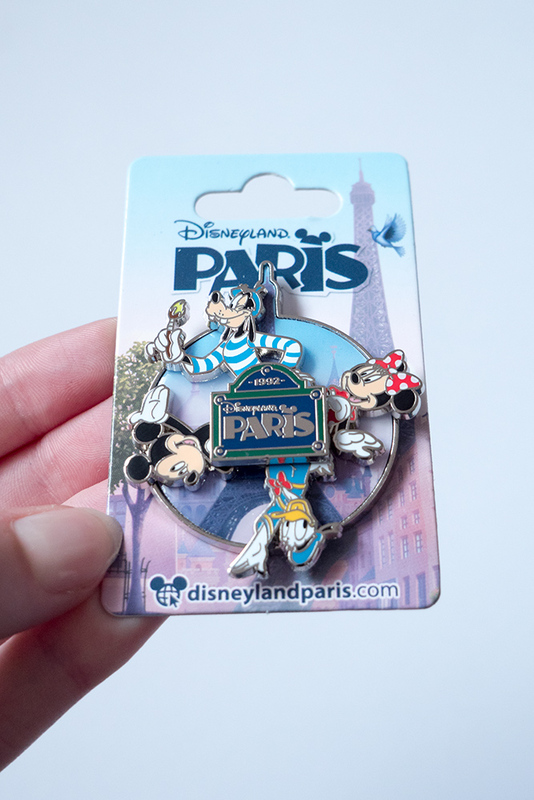 I already have a few pins from my favourite attractions in both Walt Disney World and Disneyland Paris. I went on quite a few rides I haven’t been on before and two of those happened to be *some of* my favourite rides in the parks. I bought a pin for both of the rides, Tower of Terror and Ratatouille. Whilst the two rides couldn’t be any more different from each other I absolutely loved them both! I would 100% recommend both rides, Ratatouille is particularly amazing! The Tower of Terror pin cost €7.99 (orange) and the Ratatouille pin cost €6.99 (green). The next pin that I bought I kept being drawn to every time I saw it in a shop so I eventually decided to buy it. It was a green pin so cost €6.99. 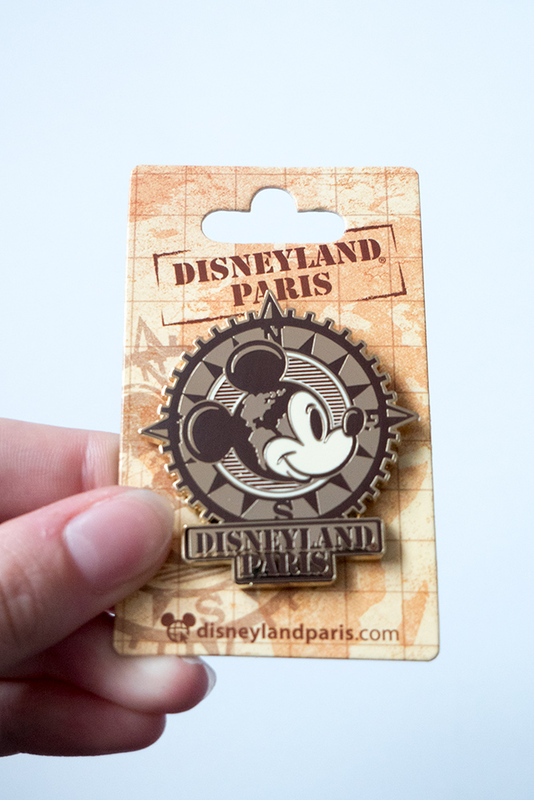 I bought one last ‘Disneyland Paris’ specific pin which I bought because I can’t resist pins that are a bit different and move. The spinning element of the pin totally drew me in. It was a yellow pin so cost €9.99. I bought three other pins (yes I told you I bought a lot of pins!). The first one I spotted and absolutely loved. Up is probably my favourite Disney film and there isn’t always a lot of merchandise for the film. I already have the Grape Soda pin which I love so I couldn’t resist this pin when I saw it. It is stunning and I think is now one my favourite pins in my collection. It was the most expensive of all the pins I bought during my trip as it is from the highest price tier pink so cost €12.99. In my opinion it is totally worth the cost. I also bought a tangled pin. I kept looking at this pin every time I saw it throughout the trip. Once I had a rough idea how far my money was going I decided to buy it. It is the most beautiful design and colours. It cost €6.99. The last pin that I bought is of the Winnie the Pooh characters in tsums tsums form. I seem to be really loving tsums tsums recently and I of course love Winnie the Pooh so I couldn’t not get the pin! It was an orange pin so cost €7.99. I bought an autograph book and matching pen. The autograph book cost €9.99 and the pen cost around €6. I used to have an autograph book almost identical to this one when I visited previously and I love the design so I decided to go for the same one. It is also one of the cheaper ones available. I wouldn’t recommend the matching pen. As you can probably see from the photos the ink ended up going all over the end of the pen. For €6 I expected better quality. I didn’t buy a lot of the anniversary merchandise but some of the pieces I did buy include two tsums tsums. I loved the whole collection of the anniversary tsums tsums but I managed to resist them all and just buy Mickey and Minnie. They are so cute in their little outfits with their accessories. I do feel like the tsums tsums are quite expensive in the parks. 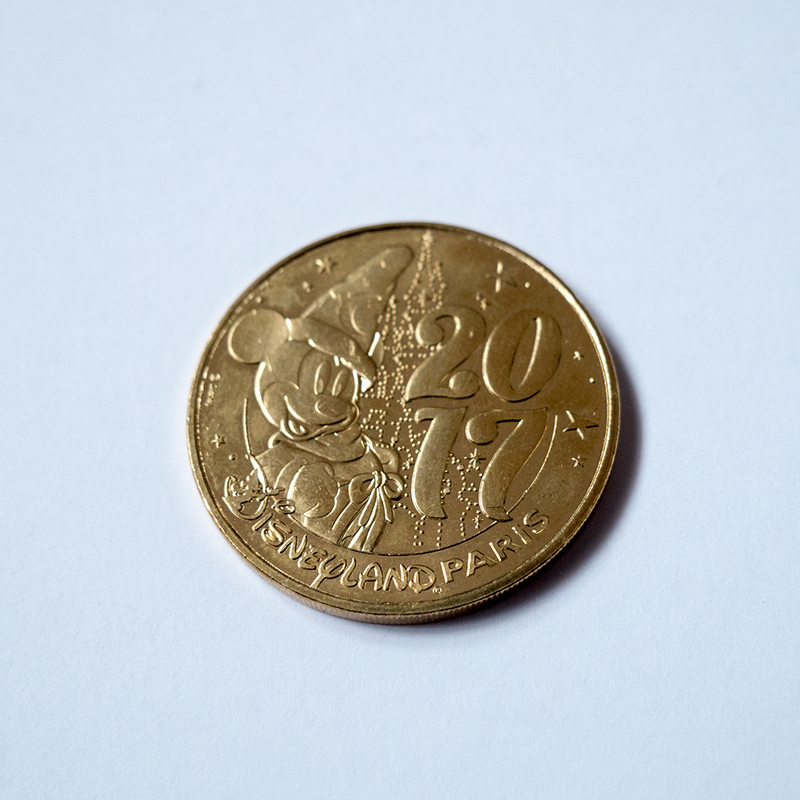 In the UK they typically cost £3 but in the parks they cost €5.99 each. For that reason the anniversary ones are the only ones I purchased during the trip. The other pieces of anniversary specific merchandise I bought is the anniversary Sorcerer Mickey. Some of the shops had an offer that if you spent €30 then you could buy Sorcerer Mickey for €9.99 instead of €19.99, which of course I couldn’t resist. He is so cute and is such a lovely size. I am really happy I decided to buy him. 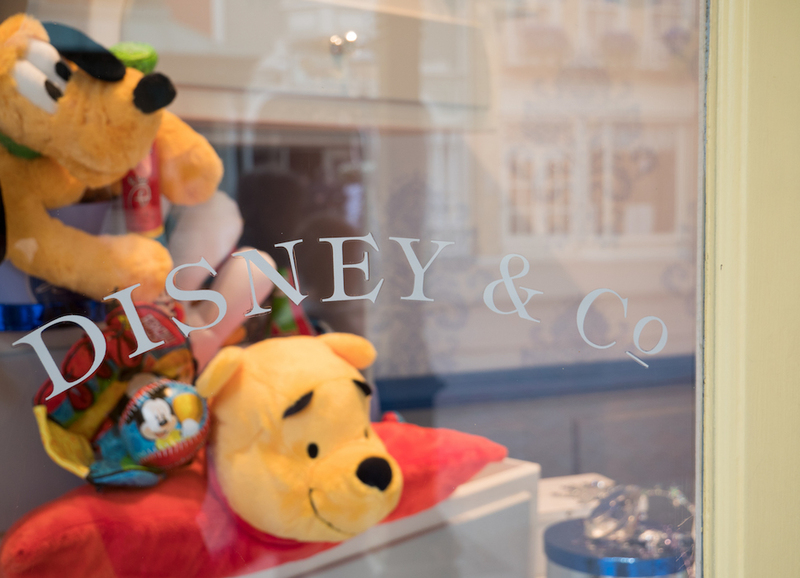 The shops that I noticed had the offers where the World of Disney, Disney Village and the Emporium on Main Street USA, Disneyland Park. I bought one other plush as well as the Sorcerer Mickey. I bought the cutest Eeyore plush you have ever seen! I absolutely love him. He is so soft and fluffy. He is extremely squishy and is so cute. He is possibly my favourite purchase of the trip if I could possibly pick a favourite. They also had Winnie the Pooh, Tigger and Piglet in a similar style, all €24.99 each. I picked up a selection of postcards from the Emporium on Main Street USA. Postcards were available in most shops that I went in and they have so many amazing ones to chose from. The ones I picked up were all €0.80 each but the prices do vary. I am most likely to use these in my scrapbook or to keep on my memory board. They are all 6×4 and would even look lovely framed! I really wanted to purchase some jewellery whilst in Disney and I looked at the jewellery stands multiple times as the ones available seemed to vary slightly from shop to shop. I decided to purchase a necklace and a ring, as I already have my pandora bracelet and earrings that I wear day-to-day. I love the necklace and the earrings I decided to buy so much and I know I’ll be wearing them everyday from now on. 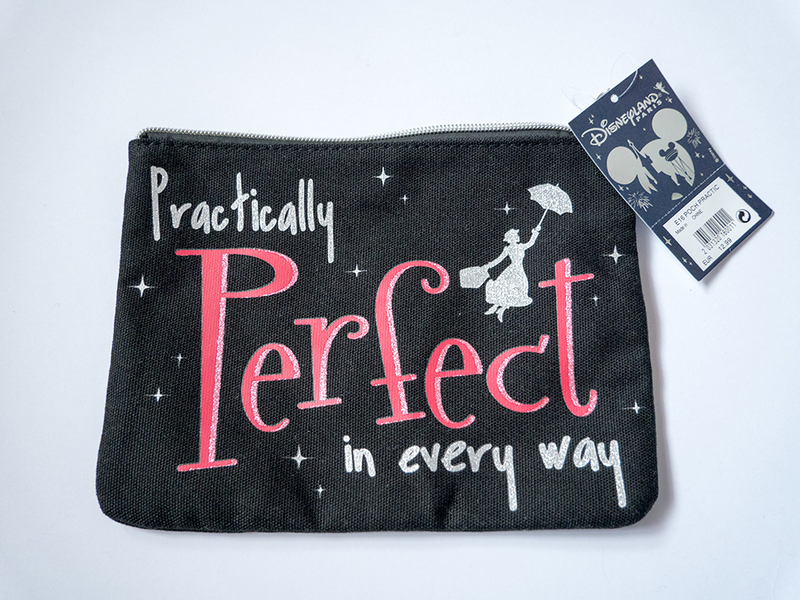 They add the perfect touch of Disney. I was really pleased with the prices of both these pieces. The necklace cost €25.99 and the ring cost €20.99 . I purchased both from the Emporium in Disneyland Park. Anyone who knows me, knows it was unlikely I would come back from Disney without a top of some description. They had so many different ones that it was really hard to pick which one I wanted. 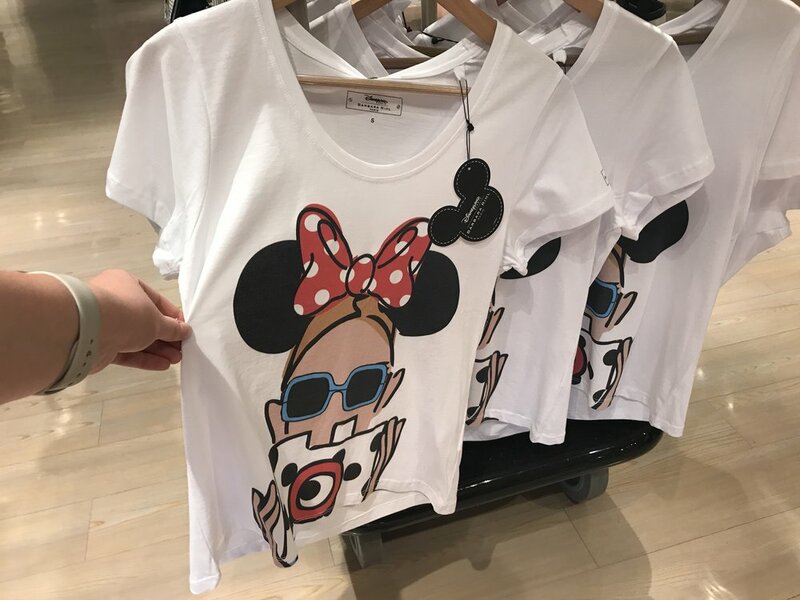 I looked round Disney Fashion in Disney Village and bought a top from the designer … I am really pleased that I decided to buy this top as the design feels very ‘me’. The rest of the pieces in the collection were very expensive around the €100 mark, so I was even more pleased when the top only cost around €35! I wore the top whilst in Disney so it is currently in the wash. Instead I’ve included a photo I took of it in the shop. From Main Street Motors in Disneyland Parc I made two purchases. The first is a large coin purse which cost €12.99. I debated getting the top in the same design but I am pleased I didn’t as now I still have a top but also something with the Mary Poppins design so I got the best of both worlds. The quality is lovely so I can see me using this for along time. I also bought a bag from Main Street Motors. They had a few cross body style bags that I hadn’t see in other places so if you are on the look out for a bag, it might be worth a visit. The bag I eventually decided on cost €29.99 which seemed to be a similar price to other bags of the same size. The quality is lovely and I really like the overall design. I like that it is Disney but not too in-your-face Disney. The strap is adjustable and it has pockets inside. I collect the ‘you are here’ mugs from Starbucks so I popped into Starbucks in the Disney Village on our way back one night and picked up the Paris mug. I am a little disappointed that they don’t have a park specific one like in Walt Disney World, but hopefully they will bring them back in the future. I thought that the mug was reasonably priced at €11.90. I made a few smaller purchases in Disneyland Paris including a pen. I couldn’t go to Disney and not get one of these pens despite being slightly expensive at €5.99. I decided to go for classic Mickey. The pens are available in most shops across the parks. 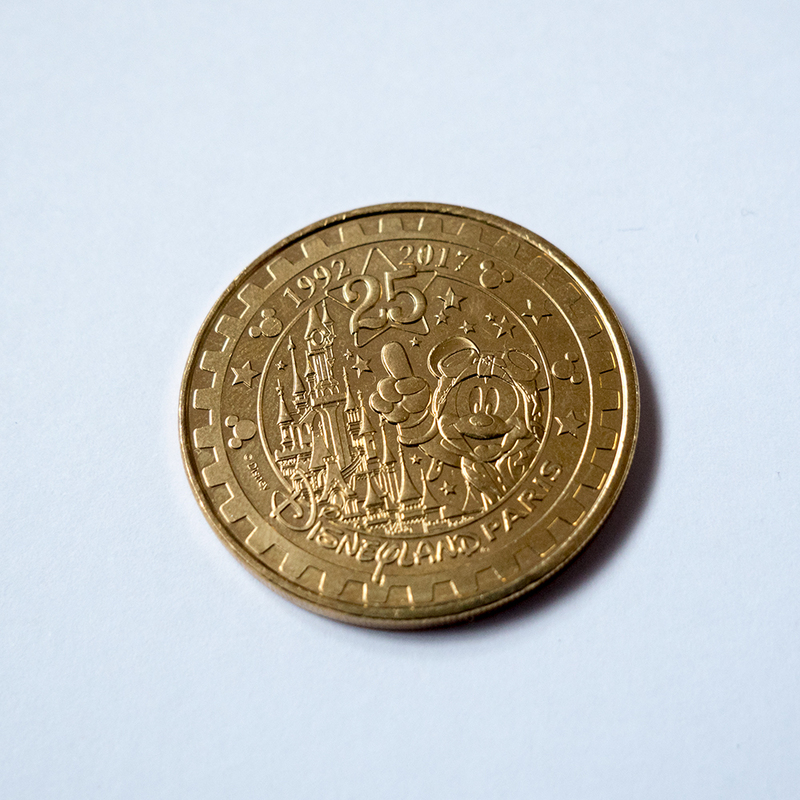 I bought two of the anniversary coins, each €2. 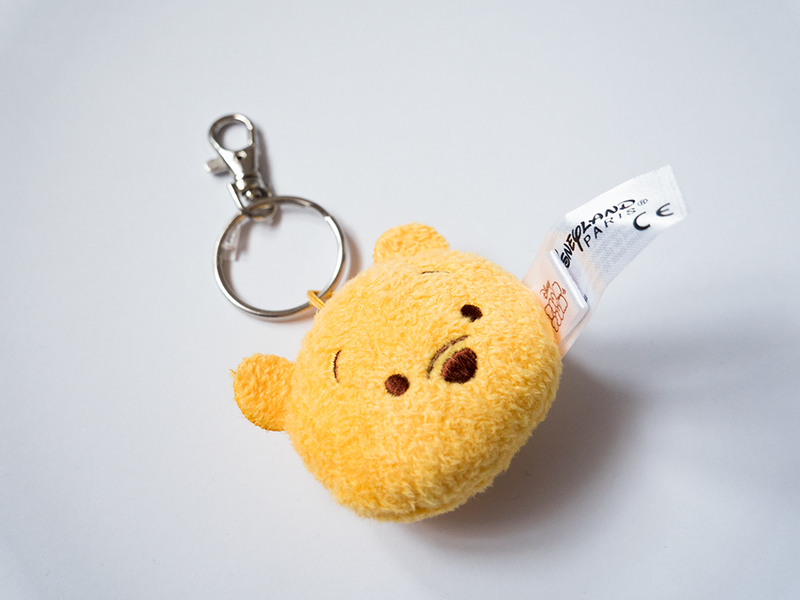 I also bought one of the tsums tsums keyrings. I of course bought the Winnie the Pooh one because he was too cute to resist! He cost around €6. My last purchase was from the Lego Store in the Disney Village. They had both a Belle and Beast Lego but I preferred the Beast so I decided just to get the one. They are quite resonably priced at €9.99. The Beast looks super cute and I had great fun building him! I have included a few before, during and after photos. 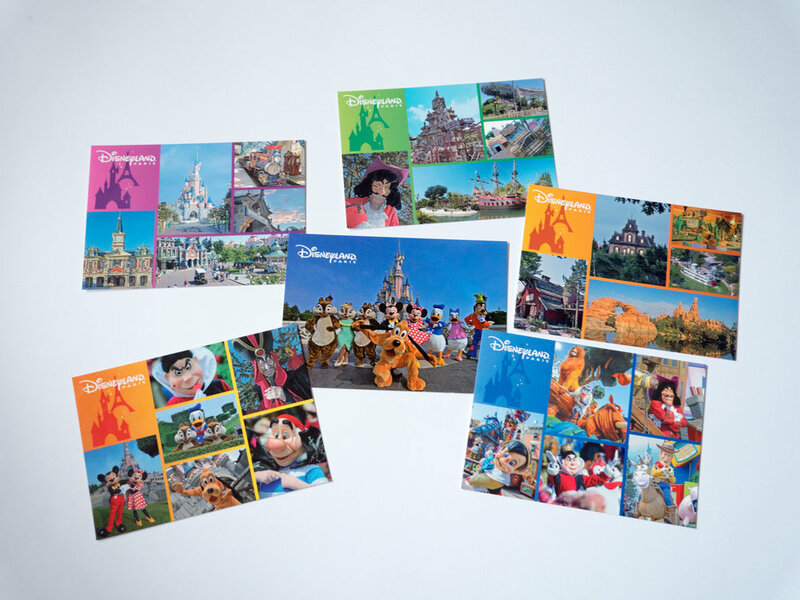 That is everything I purchased from Disneyland Paris last week! 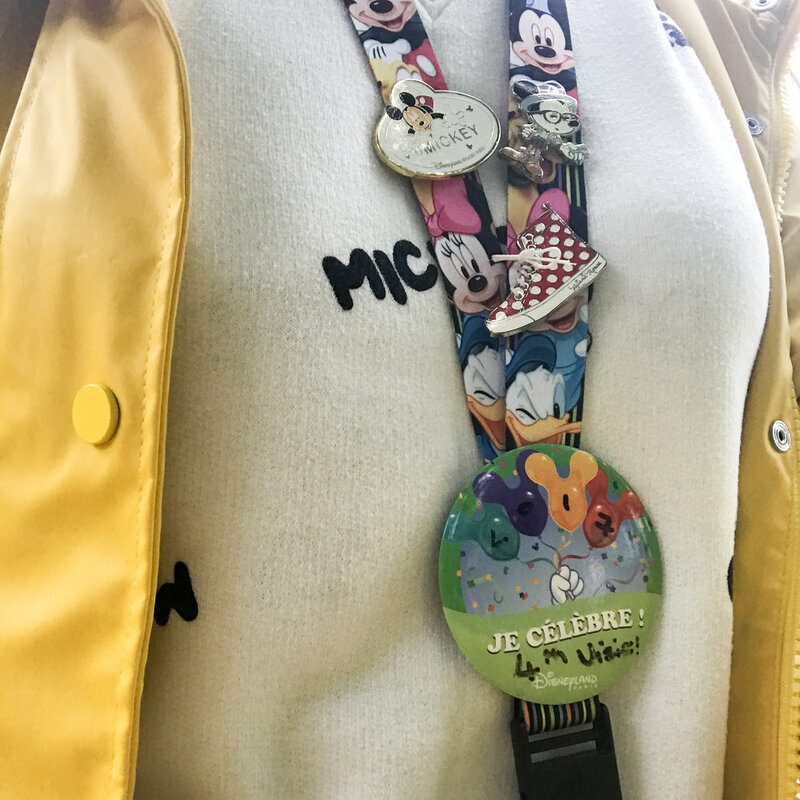 I hope you enjoyed this rather long post and that if you are heading to Disney soon it has given you a bit of inspiration. Love your haul! I need that tangled pin so cute! And the ratatouille and tower of terror ones! I also collect the Starbuck mugs – so sad they don’t have a DLP one :(. Thank you! It is so pretty, I can’t seem to resist pins clearly! Same its such a shame, I bet they would be so beautiful like the ones from WDW. Thank you! I love doing hauls, I found them so helpful before going to DLP to see what was out there.